Are you thinking about renovating your villa? Consider starting from the ground up and replace that old, outdated flooring! With all of the flooring options there’s a great deal to consider and it can feel overwhelming. Not to worry. The experts at Milestone are here to help! We’ve compiled this helpful guide to help you consider the costs, benefits, and the disadvantages of each type of flooring before you commit. 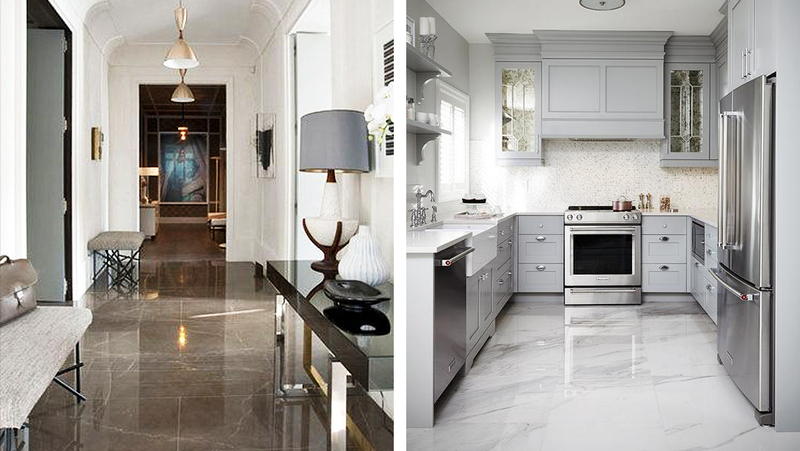 A bit more expensive than other flooring options, marble flooring injects an instant refined beauty to any space while creating a rich look that is sure to impress. For those individuals looking to add artistic design to their home, marble tiles can be arranged and prepared in creative ways to add an additional element to your home. Additionally, marble possesses a unique veining with a wide range color options that truly make a standout, luxurious statement in any room. • Luxurious visual statement: Marble flooring instantly creates a stunning, attention-grabbing statement in any entryway or room. • Create an artistic statement: Marble flooring is ideal for designer flooring with inlays, and it can be arranged in a manner that creates a creative work of art in your flooring pattern. • Durable and strong: Marble is not only long lasting and durable, but it’s also water resistant and bacteria resistant. • at a budget friendly price point. Versatile and elegant, porcelain flooring tiles are an innovative product gaining popularity amongst villa owners and interior designers alike. Fired at higher temperatures than conventional ceramic tile and constructed from super-fine porcelain clay, porcelain tiles are durable and made for demanding purposes for both interior and exterior spaces. • Variety: Porcelain flooring offers a wide variety in color and tile type, to include glazed and unglazed, high-gloss and refined, or textured to lend the illusion of stone. • Sturdy, resilient and versatile: Porcelain flooring is resilient and resistant to wear and tear, and it can be applied both indoors and outdoors. • Low maintenance: Porcelain flooring is resistant to staining and does not require any sealing for water resistance. • Durable: Porcelain flooring is fired at much higher temperatures than standard ceramic tiles which allow them to last a lifetime, even in the highest traffic areas of your home or office. Modern manufacturing techniques allow ceramic producers to produce materials that can be printed in a variety of ways providing you home with numerous design options. There are few things in a home or office more inviting than beautiful, natural wood flooring. Whether you are creating a traditional or contemporary space, wood flooring is sure to take your space to the next level. • Straightforward installation: Wood floors are milled to guarantee a durable and uniform fit in any room or space. 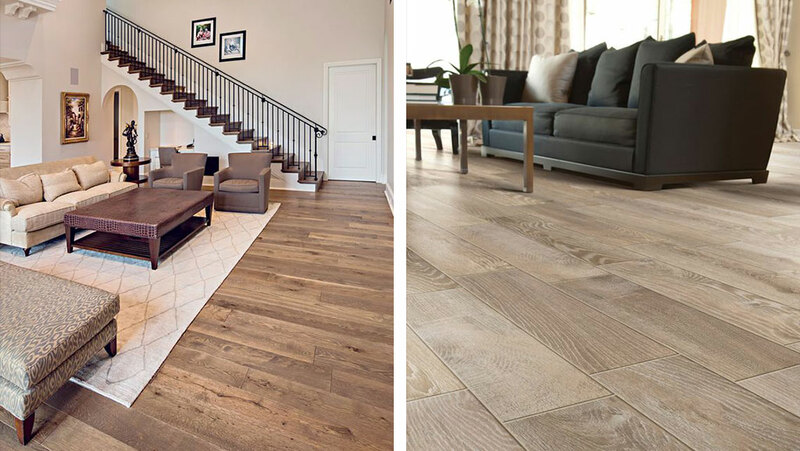 • High-quality appeal:: Wood flooring instantly provides a beautiful, high-end aesthetic with the warmth, charm, and beauty of rustic natural wood. • Strength and durability: Wood flooring is strong, and made to withstand heavy foot traffic areas and active workspaces. • Variety: Wood flooring comes in a wide variety, ranging in color, stain and specific wood types (i.e. oak, bamboo, etc.). • Ageless quality: Wood ages gracefully and looks better with age. The more you use your hardwood floor, the better it will look! Looking to keep it natural? 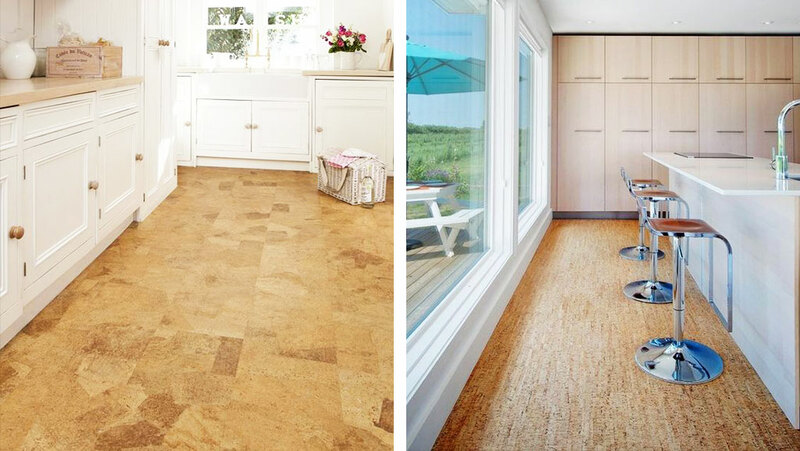 Cork flooring provides an aesthetically appealing flooring option that looks as good as it feels! Available in tiles and planks in many styles, colors, and sizes, cork flooring is a unique flooring option that is sure to leave a lasting impression. • Durable: Cork flooring resists cracking and abrasions and is impermeable to gas and liquid. When properly maintained, cork flooring can last 40 years or more. • Healthy: Cork is naturally resistant to mold, mildew, and termites. Cork is also anti-microbial and does not shed microfibers or off-gas to negatively impact indoor air quality. • Comfortable: A cork floor “gives” when compressed, providing a comfortable cushion that looks as good as it feels. • Quiet: Cork is a natural thermal and acoustic insulator. Rooms with cork flooring are naturally quiet and warm. • Aesthetically versatile: Cork flooring is available in tiles and planks in many styles, colors, and sizes. You can use cork planks to create an almost seamless-looking floor or create a nontraditional effect by alternating tile colors. When it comes to your home or office, your flooring provides the first impression and foundation for your entire design. Why not start off on the right foot? 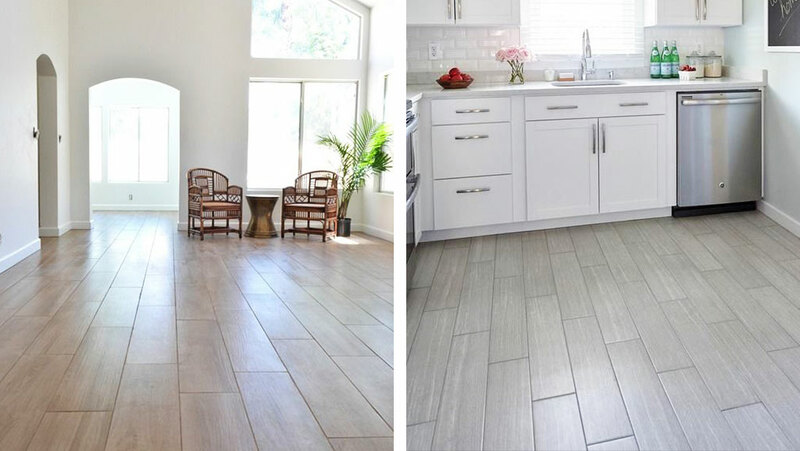 Contact the experts at Milestone to learn more about how we can help you renovate your space from the ground up with custom flooring solutions.